Wait until the bees settle on a branch. Take a box (cardboard, tote, beer cooler, hive box, whatever). Lower branch with bees into box, shut lid. Install bees in new hive. My bees’ library card has apparently expired and all bookshops are too far to fly – or so it seems. My girls usually tend to fly to the top of a 75 – 100 foot cedar and thumb their collective noses at me; well they would if they had noses. But it would seem one hive did read the book – but missed a few points. A massive swarm took off just as I was about to take a break in preparing boxes for splits. They headed for a near-by young tree. So far by the book. I got out the ladder, but the tree trunk was slender, and the ground uneven. I did have hive straps in my truck, so I double lashed the ladder to the tree for stability. Got the plastic tote into which I always put swarms. 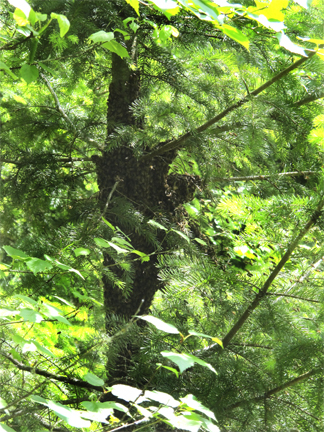 Then spent the next hour getting the girls out of the tree, and then moving them into a hive. The hive was later taken to a down river bee yard, where the blackberries are blooming and the raspberries are about to bloom. Normally my bees swarm in July. This year I have had swarms emerge in May and June. Admittedly, this is the first year that I decided that the snows and heavy rains of April were not the time to do splits, and I would wait until May. April splits here are usually very small because, I think, the bees are still in cluster trying to stay warm. But it would seem that next year, it’s back to April splits. I figure you just can’t win sometimes. A hive’s got to do what a hive’s got to do… My girls get plenty of space (supered when five out of ten frames are covered with bees). Brood is brought up, if there is brood in the top box. If the top box is honey, then that box and the box above are checker boarded. Both methods should help avoid swarms – or so say the books – but, as I said, the bees don’t seem to be reading the same books. I do what I can to stop the bees from swarming, but if they go they go. I have had to learn not to worry about them. I’m happy when I can catch them and give them a new home. If I can’t I figure there are lots of old Big Leaf Maples here with gaping holes and hollows that are perfect for bees. So, hopefully a few will survive in the wild. Just a note to say, I would never had gone up the ladder had it not been secured. No swarm is worth a broken leg or back. A short fall has laid out a lot of folks I know changing their lives forever. Be safe when going after swarms – they’re just part of beekeeping. Sometimes you get to catch and keep them; sometimes you’ve just got to let them go. That’s part of the news of what’s happening at Brookfield Farm Bees And Honey in Maple Falls, Washington. 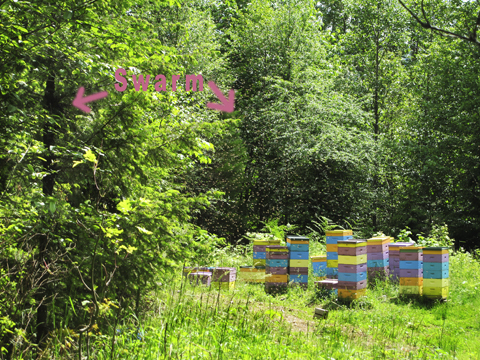 After the queens arrive, tomorrow, and I move the Whatcom hives – I’ll write a bit more about this somewhat hectic period. 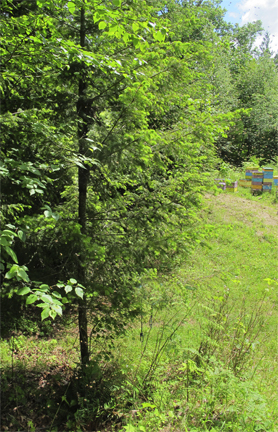 This entry was posted in Beekeeping and tagged Brookfield Farm, honeybees, June, Maple Falls, swarm, Washington. Bookmark the permalink.